Lex was adopted January 2004 by Brittany and Taylor at the age of 5 ½ months. They write, "He is about 7 months in this picture. Lex is extremely friendly and loves playing with the toy mouse. Lex is very nice to play with and loves snacks. Lex is definitely the nicest kitty to snuggle with." Griffin was adopted January 2004 by Brittany and Taylor at the age of 5 ½ months. They write, "He is about 7 months in this picture. Griffin is shy but loves chasing the toy mouse up the play structure. Griffin loves to sleep on the stairs which makes it difficult to walk down the stairs. Griffin is definitely the prettiest kitty to watch." 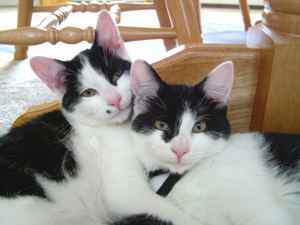 Tanya writes, "We adopted Harry Potter (nee Stuart) and Gipper (nee Dennis) in January 2004. The brothers were 4-1/2 months old then. Harry is a cat's cat and loves to 'hunt' his toys. Gipper is a people cat and talks to us a lot. He's our Great Communicator. They have settled in very nicely. It was an amazingly smooth transition. As you can see in the photograph, they love each other very much and we really enjoy seeing them play, cuddle, and groom together. They are amazing with our children. The kids adore the cats and the cats adore the kids. Thank you very much for matching us with these great little guys. We couldn't be happier with our expanded family." 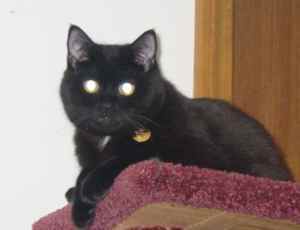 Torrey writes, "I adopted Magic (formerly known as Koosh) in 2000. She was very shy when she first became part of the family but she is a real cuddler now (and drooler). She lives with one other cat and two dogs but has claimed the pillow next to mine as her preferred place to sleep. She is a great cat and a wonderful part of the family. 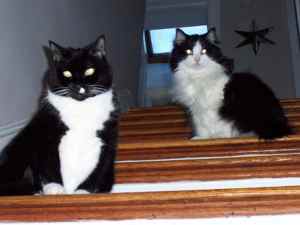 Here is a picture of her ( on the right) and her sister guarding the stairs. 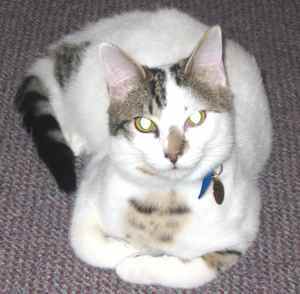 Paul writes, "I adopted Oreo (as he was known then) in November 2003. 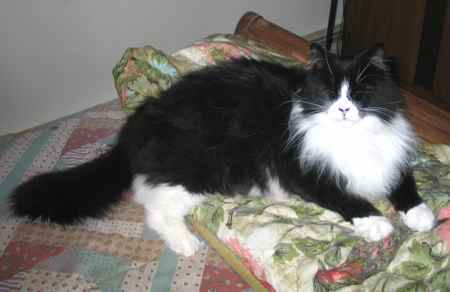 He's been rechristened Bustopher Jones because with his tuxedo coat and huge size (18 pounds!) he so closely resembles the St. James's Street cat of T. S. Eliot's poem. He's a real sweetheart and has taken to his new home and his new companion, a 12-year-old female named Jellylorum. They're quite a contrast--she only weighs 7-1/2 pounds. Bustopher likes to lie flat on his back with all four paws in the air so that you can rub his tummy. He also likes to drink from the water tap in the bathtub."